Last night was a disgrace to Detroit sports with the Detroit Red Wings taking a puck in the shorts, losing to the St. Louis Blues 6-0. When were the Blues any good do beat the pants off of someone like that, probably in the 90’s some time. I know the Red Wings probably miss Nick Lidstorm because he was so active on the ice breaking up pass and saving the team with his awesome defense. But seriously guys the Grand Rapid Griffins could of shown up to play better puck than you guys did last night. Last night my Facebook feed was blowin’ up with statuses that said “what did the Detroit Lions dress up as the Red Wings tonight. 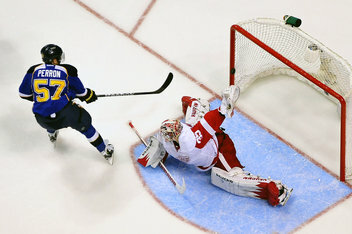 I mean aren’t the Blues rivals of the Detroit Red Wings and we got slapped in the face last night. Mike Babcock has to go back to the drawing board. Come on Red Wings we already have the Detroit Lions to make fun of we don’t want to put the wings in the mix, because currently the Pistons get laugh at almost every night. Lets see what they can do in tomorrows game vs the Columbus Blue Jackets. But if you are a Detroit sports fan, Ndamukong Suh is headed to the Pro Bowl for the 3rd time in a row.